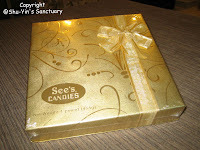 I just received my golden box of See's Candies - all the way from U.S...thanks to Alan & Bee Wooi! 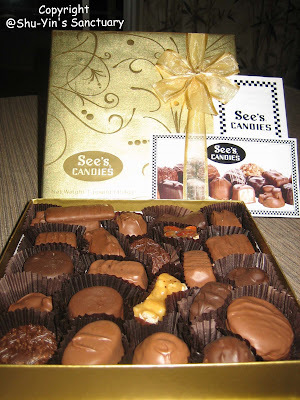 Anyway, this should be my 2nd time tasting See's Candies. First time was when one of my IDT US counterpart gave one of us as souvenirs. Anyway, this 1 pound box costs me a freaking USD17 - which is almost RM58. Expensive huh? Well, being a chocolate lover, and considering that it is not often you can get people to help you buy it from US, it should be worth it ya? Look at the amazing wrapping on the box. 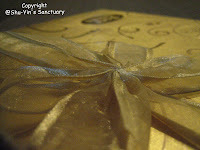 It was wrapped in gold. However, when I actually have a taste of them, I find them too sweet for my liking. These chocs are smooth and rich, which means a quality chocolate, but I really find them a tad too sweet. I don't remember them being this sweet when I first tasted a piece last time. Well, either they make them sweeter now, or eating just a piece the last time I didn't quite taste the sweetness. So, nah, they are not my favourite chocs! I wanna pay a visit to your house and makan your chocolate! hahaha.. How come even if you tell your darling that you bought the expensive chocolate and he will scold you?? Peter is Berkshire Hathaway's boss? i find US chocs usually too sweet. 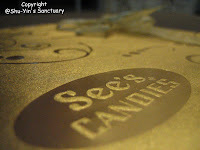 how do see's candies compare? You also eager wanna know, right? POS laju to me, I'll be able to tell u the result in one day!!! 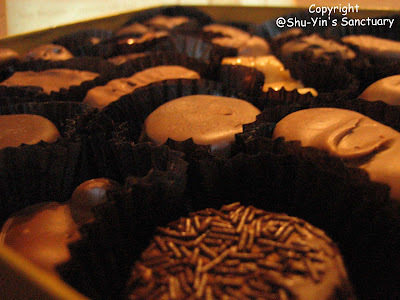 shuey...hehe.i havent really tasted the chocs yet. jen...wah..u comment so long in my post. if u type in this comment in ur own blog, it will make 1 entry/post dee. blueks. dont tipu my chocs. and dont send ur "spy aka shuwen to steal my chocs"! 1st or 2nd Wedding Anniversary ? Wedding Anniversary @ TRR again ?